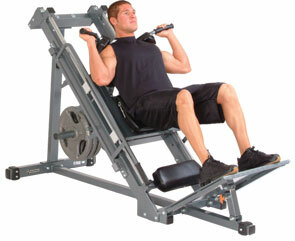 Key Fitness KF-LPHS (Leg Press/Hack Squat Machine) is a lower body exercise machice that can be easily converted from leg press to hack squat positions. It has oversized foot plates and also has adjustable foot plate and back support for proper leg alignment. *Note: Most of the sites, stores or shopping portals listed above sell Key Fitness KF-LPHS (Leg Press/Hack Squat Machine) with discounts and other exciting offers. There is a possibility that the some of above websites are not selling Key Fitness KF-LPHS (Leg Press/Hack Squat Machine) now. Toughtrain.com is not liable for such cases or instances. Also we do not recommend any seller for Key Fitness KF-LPHS (Leg Press/Hack Squat Machine) and a buyer should buy from where he/she gets best deal with quality of products, service and on time delivery (shipment). I have the Keys Fitnes Leg press Hack squat. Nice machine. The only problem are the nylon rollers that guide the carriage are broken. Does anyone know of a source that can provide these rollers? HI I have the same problem with my KF-LPHS the nylon rollers that guide the carriage broke where can I get them? Hi I have a keys fitness leg press hack squat I need replacement nylon rollers would you have any or do you know where I can buy some? Thank you.